for all of our Exhibitors at METSTRADE 2018. 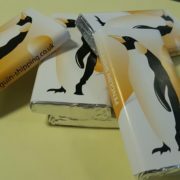 The new supply of PENGUIN SHIPPING chocolate bars has arrived. 3000a Parkway, Whiteley, Fareham, Hampshire PO15 7FX.